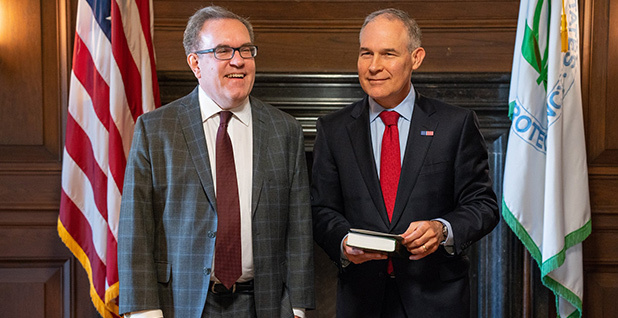 The scientific transparency proposal championed by former EPA Administrator Scott Pruitt seems to have been slowed by logistical challenges and widespread opposition, according to experts on both sides of the effort. The proposed rule, which some administration officials had hoped to finalize quickly — possibly even before EPA's science advisers could weigh in — is now on pace to be wrapped up in 2020, the Trump administration announced yesterday. The delay was celebrated by environmental groups opposed to the effort, which would restrict EPA's ability to use some pollution studies that protect participants' private health information. But EPA insists it is still moving forward with the effort, albeit at a more measured clip (Greenwire, Oct. 17). "I do believe that Administrator Pruitt was perhaps more interested in the politics than in the substance" of the scientific transparency proposal, said Jeff Holmstead, an energy lobbyist at the law firm Bracewell LLP who is close to the Trump EPA. Restricting the use of some health data in the name of "sound science" has long been supported by the tobacco industry and conservative politicians like Pruitt, who previously served as Oklahoma's attorney general (Greenwire, June 18). The position on the proposal of acting EPA Administrator Andrew Wheeler — a former coal lobbyist and Senate aide with little flair for politics — is less clear. "I think that without him there, Administrator Wheeler and others realized that — from a policy perspective — this is an important issue, but it's more complicated than the original proposal acknowledged," said Holmstead, who was EPA's air chief during President George W. Bush's first term. Holmstead, who said he's not working on the issue for clients, supports the aims of the transparency proposal. "Questions about replication of studies have become a relatively big issue, and so you have a number of scientific journals that now have a position that they won't publish academic work unless the data and model that was used to reach the conclusion are available for replication," he said. "And I think it's a good thing for government to be moving in same direction." One of the loudest critics of the proposal has been the American Association for the Advancement of Science, the world's largest interdisciplinary scientific society. "This is not about transparency," said Sean Gallagher, a senior government relations officer at AAAS. "There has been no significant proof, up until this point, that the science that EPA has used has been wanting." Gallagher hopes Wheeler and his team came to the conclusion that, "given all of the opposition, we should wait," he said, name-checking critics ranging from the congressionally chartered American Chemical Society to the Pentagon (Greenwire, Aug. 28). "That has been our intent all along: to convey to them the overwhelming body of both evidence and thoughts from the scientific community writ large that this is a bad move," Gallagher said. Whether EPA still can or should address the issues bogging down the rule remains a source of disagreement. "They will still come out with the rule, but I think it will be quite a bit more nuanced and sophisticated than the original proposal was," Holmstead predicted. "And they may well come out with another proposal." The American Chemistry Council, the chemical industry's biggest trade group, remains strongly supportive of the effort. "EPA's proposed rule is an important step toward ensuring the science the agency relies on in decision-making is transparent and accessible, and we look forward to continuing our work with the agency to help ensure it can reach that goal," ACC spokesman Jonathan Corley said in a statement. Meanwhile, AAAS has called for EPA to scrap the rulemaking altogether, although it could be more supportive of the rule if it were vastly overhauled. "If they make the exceptions to the rule — meaning, if they gut it in its intent, to the extent that EPA can continue to use all the science that it has been — then yes, we would be happier with that," Gallagher said. "But then we get back to the argument of, why would you do a rule that allows you to continue to operate how you did?" The delay comes shortly after the Senate Environment and Public Works Committee held a hearing on House-passed legislation that could enshrine the scientific restrictions in law (E&E Daily, Oct. 4). But Holmstead doesn't believe the congressional movement is related to the regulatory delay. "I don't think EPA will simply stop its work because Congress might pass something," he said. At the same time, the legislation has a long way to go before making it to the president's desk and not much time to get there before the end of this Congress, according to Gallagher, who spent nearly a decade on Capitol Hill before joining AAAS. "They haven't had a markup on the bill, so they haven't started the legislative ball rolling," he said. "And it's not as if we're dealing with any other unimportant stuff."